The challenge of raising girls becomes more apparent every day. Acadia had her 6 month checkup yesterday. The doctor made mention of her 2 different color eyes. Now, I am literally the only one to notice the difference so far. It is not like a blue eye and a brown eye. One is a hazel color and the other is predominantly brown. But, the doctor wanted to let me know that they make colored contacts now and she should be able to 'cover them up' as she gets older. (Let's get past that she thought I might not already know color contacts are in existence... for the past 20 years!!!) Is she seriously already telling my, as my daughter is 6 moths old, how to cover her 'flaws'??? Her eyes are gorgeous with the same almond shape as mine and Ariana's. And if they do indeed stay unique colors, I hope she embraces it and is very proud of them. Anyhow, as I was contemplating this whole issue in my head last night, I hear Colby say to Annika, "Man, you need to get some sun. You are pastey white." "What? 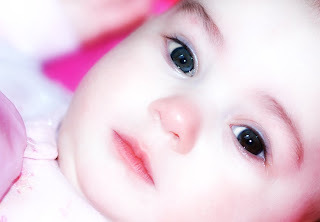 She has gorgeous milky skin and she's THREE!" "Well, she could really use some color, she is almost transparent." Argggg. This is the same man who said in front of Ariana, "Jesus, Jessica Simpson is getting fat." Or tells me "Wow, are you going to eat all that?" Helloooo??? Eating disorder anyone? As if my girls won't get enough crap in the media to threaten their body image, now I have doctors and dad's to contend with too? Anyone with sage advice on raising confident, secure, independent daughters? I have 5 kids, 3 are girls....and I say let her be beautiful the way she is. I'm sick of these poor girls being driven to conform to what society thinks is perfect...and it's just not. It's boring, unhealthy and not real. Her eyes are gorgeous and that will be a quality that she can own and love and be proud of...and milky skin...is beautiful!! Go w/ your gut....and don't let anyone tell your girls they need to be ANYTHING DIFFERENT because they don't. My girls have their unique qualities and me too....and we learn to love them and live w/ them. I get so frustrated too...but we just have to keep raising beautiful, strong, independent girls....they'll make it! My little girl that just turned 3 wears hearing aids. At first we got the skin tone ones with clear earmolds so you couldn't really noticed and they thought that she should be proud and make it something fun for her to wear. So now she really goes crazy with colors. Definitely embrace what makes them "different"
My stupid husband has said Caitlyn is getting chunky infront of her and I seriously almost kicked him in the balls. Men are clueless. Just take him aside when the kids are in bed and calmly tell him what he could potentially be doing for their self-esteem. put your husband in front of the internet and a few stories of seriously screwed up girls so he can see what happens when little girls grow up with horrible self esteem and bad body images. Nothing is about size, it is about healthy. Nothing is about what your body LOOKS like, it is what your body can DO in our house. My girls talk about eating junk food makes it so you can't run, do gymnastics, you get tired. When we eat good food we can play outside longer, run with the dogs, climb the play house, have energy. Make the correlation between good choices. Mostly, we just set example for our kids. We eat well, we move, we accept our bodies the way they are and don't talk about diets. We also talk about other people and accepting them the way they are, even if they made poor choices. Hard to fight the outside world, but you gotta keep up the battle and hope they listen to god old mom & dad more than everyone else. My 4 year old made me so proud the other day. She said "I am Bew-tiful on the inside." That's what I say to her everytime she asks if she looks pretty. I say "You do LOOK pretty, but what's more important is that you're pretty on the inside!"